What Does He Look Like? Kooky Creatures Guess Who Activity! It's a tad boring for my students as they did a very similar lesson in grade five and so, it has become quite repetitive. But, my co-teacher and I have tried to bring some new activities and new vocab to review the topic and make it more interesting. And today was a great success ! 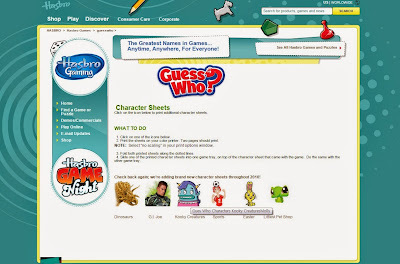 I simply googled "guess who game print" and found the Hasbro website that offers six different Guess Who PDF files to download and play - FREE! I chose the "Kooky Creatures" file and saved it to my PC. Anyway, so after that quick review with the creatures on screen to help me further explain...we started the game. I went first by describing a creature in 3 sentences and told them, if they knew who I was describing , to put their hand up and tell me the answer. 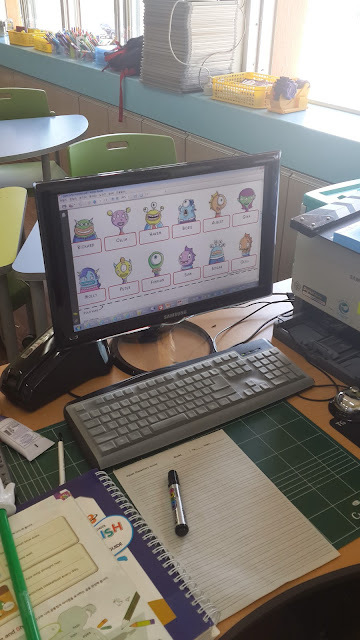 I stood at the computer to describe and once a student had guessed correctly (which was fast) they would come and be the describer, and also stand at the computer with me. The PDF file has four rows of creatures to choose from. 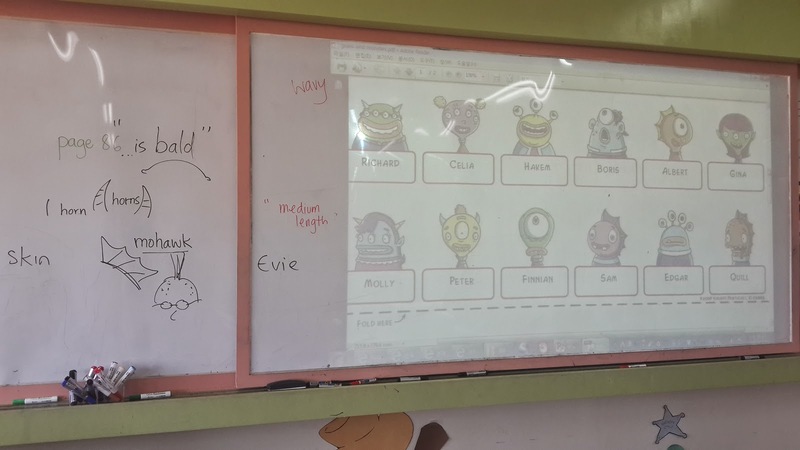 I wanted to make it zoomed in for the projection on the board, and an easier read for the students -so we did 2 rows and then switched after a while. The activity went really well, and many wanted to guess and raised their hands constantly. You can also print the PDF file and play in pairs or groups - it's so great as it's free and the characters are so fun! 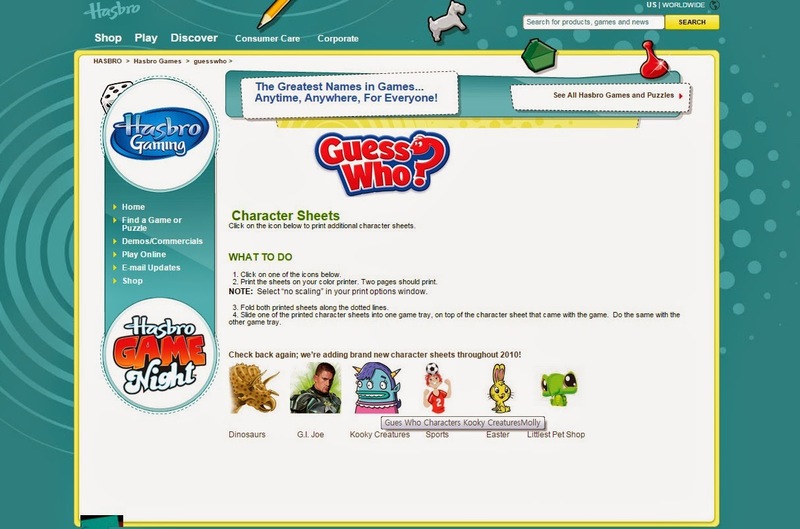 Also, here are some websites that offer online Guess Who - I can see a way of teaching with this in a class also, I have yet to try it out, but when I do, I'll post about it. 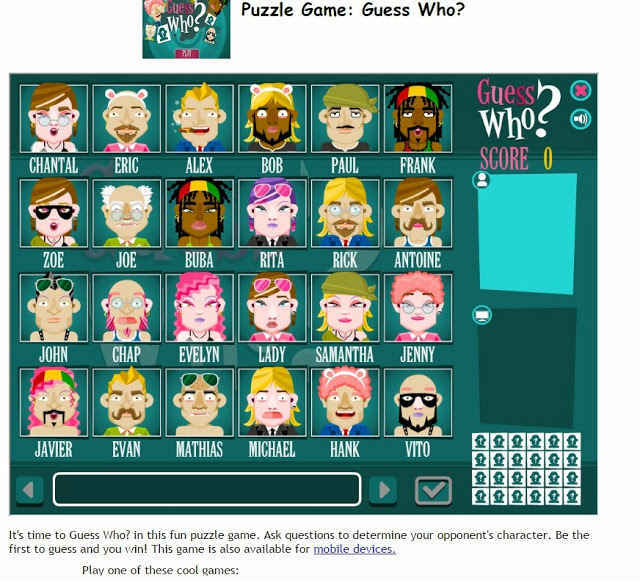 Guess Who Online 'puzzle game' : very nice looks and lots of different looking characters, human but cartoonized. You choose a question to ask from the panel below and by using the arrows on either side. A dialogue box will pop up to ask about your chosen character. I would play as a class against the computer and have students tell me what question to ask and who to guess and then have a student come up and play on the computer with the class also - they love any excuse to use the PC so it would be a hit, I'm sure. The questions can be a little tough though, maybe a quick review first. And this site - Guess Who English on Miniplay. It's not as pretty but it's simple and that can work well -or better in a lower level class especially. The questions are in the orange boxes. This would def be better level wise for an ESL class who just started this topic. But back to the Hasbro site and print outs - I am still very pleased! There's even a G I joe PDF available - good for the boys! Also, there's a sport themed PDF 'guess who' as well which I plan to use later for a review lesson on sports and descriptions. It would be useful for practicing sentences and reviewing tenses... like "he is playing" or "she plays" etc. I suggest you do download now! What a cool website! Thank you for this post. I wanted to actually take a step back and find some things that were already created instead of making my own. My brain is starting to shut down.